I don't know about my fellow crafters, but I've been having oodles of fun creating and celebrating in the festivities over at Papertrey Ink. 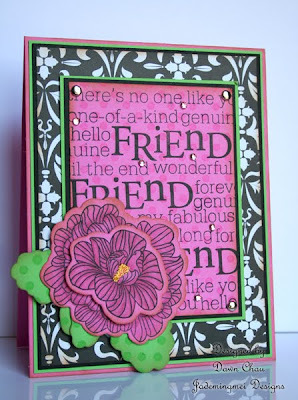 It would be hard to pick just ONE favorite as I love all their products, but for their new Make It Monday Challenge, I picked out In Bloom and Friends 'til the End to ink up. 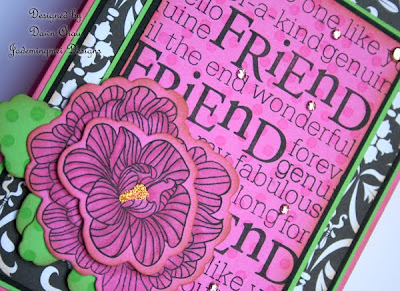 I love the In Bloom flower die, not only does it cut nicely, it's easy to match up the stamp after the die has been cut. The leaves are from the coordinating die with In Bloom and instead of using the leaf stamp, I opted to use Polka Dot Basics. 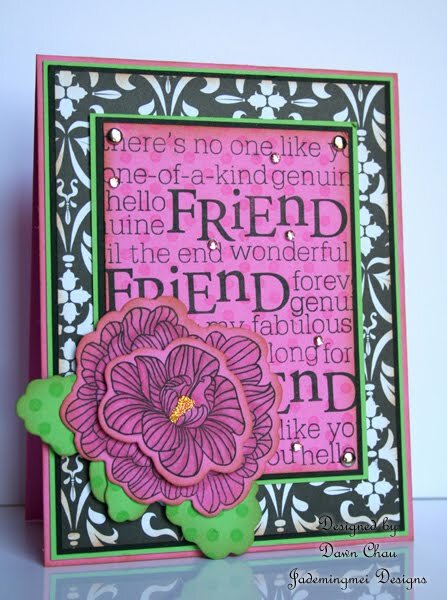 I also used Polka Dot Basics on the pink cs before I added all the "friend" sentiments. That is just so pretty! I love all your cards. I've been coming by but not commenting...but just wanted to say hello. Gorgeous card! I love how you used the friend sentiments. This is so striking. Great job! fun & fresh card! luuuv the sprinkling of bling :) Great job!